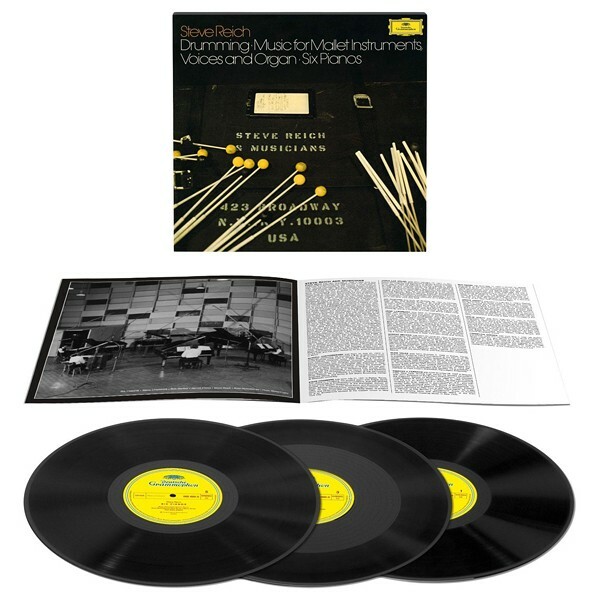 A Deutsche Grammophon celebra o 80º aniversário de Steve Reich com uma edição Deluxe, numerada e limitada desta gravação revolucionária de 1974 com 'Drumming', 'Music For Mallet Instruments, Voices And Organ', and 'Six Pianos'. Apresentada no formato 3LP box original, inclui as notas originais de Reich com várias fotos da sessão e publicação inédita de quase 50 cartas suas sobre esta espantosa gravação. 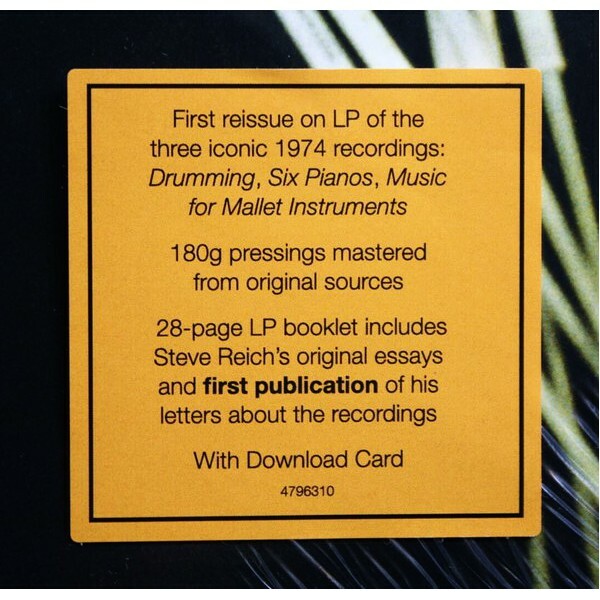 Originally released in 1974 in a 3-LP set, and now re-presented on LP with new, unique documentation, Drumming was a landmark recording in Steve Reich’s early career. This is the first time the recordings are being offered on LP since their original release. Recorded in the Polydor Studios in Hamburg in January 1974, the set comprised his longest work to date, Drumming of 1970-71, lasting nearly an hour and a half, and two newer works of 1973, Six Pianos and Music for Mallet Instruments, Voices and Organ. 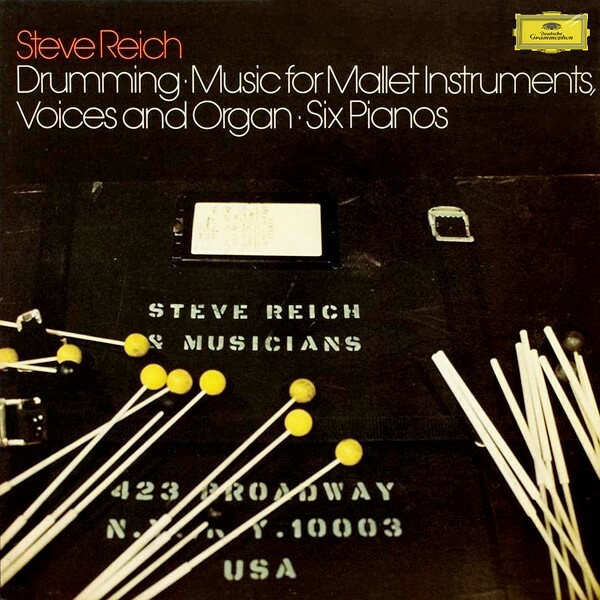 For at least one critic, 1974 was the year when Steve Reich emerged with the now famous Deutsche Grammophon album “which [brought] Reich above ground“, the 3-LP set of Drumming, Six Pianos and Music for Mallet Instruments, Voices and Organ. The album was released in the autumn of 1974. 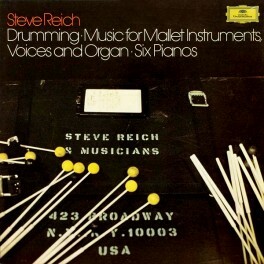 The history of its inception, however, went back to May 1972 and is richly documented in a series of letters, telexes, telegrams and internal memos preserved in a Deutsche Grammophon A & R file – including no fewer than 46 letters from Steve Reich himself, mainly addressed to his producer Dr. Rudolf (Rudi / Rudy) Werner. Below are some extracts which give a flavour of the complexities of A & R and project development which are drawn from a far longer document included in the new 2016 box set setting out more of the correspondence. They show an artist keen to work with the yellow label, fiercely protective of his musicians, determined to secure distinguished cover art, ready to sort post-production glitches, persuasive in ensuring the best possible album emerges and furious at lack-lustre marketing.